ALL THE CANINE AND FELINE NEWS THAT'S FIT TO PRINT! Hey everybody - Don here! I'd like to share a quick story that, if nothing else, underlines the vital importance of weight lifting. Didn't see that coming, did you? Aproximately two weeks ago (mid March), I was house/pet sitting for some great new clients of ours who have incredibly affectionate, incredibly beautiful, and incredibly huge dogs - including a 130-pound Great Dane (this individual is pictured above, but his identity has been protected). As is always the case in dog-walking, the second you let your guard down or let your mind wander, something unexpected happens. Such was the case when I was walking Mr. Great Dane and his good buddy the Yellow Lab one morning. We're walking alone the same route we'd been traveling for days, when suddenly a leashless, ownerless Boston Terrier magically appears 10 feet away from us. The next thing I know, I'm on the ground, I'm violently flipped over on my back, and I'm being dragged 15 feet through the mud and grass! Now, aside from the fact that I JUST washed those clothes - thank you very much - the only real problem with this situation was that the leash loops were wrapped around my fingers when this happened. Next stop: doctor's office! To make a long story short, the result was a bad sprain in my left index finger! Mr. 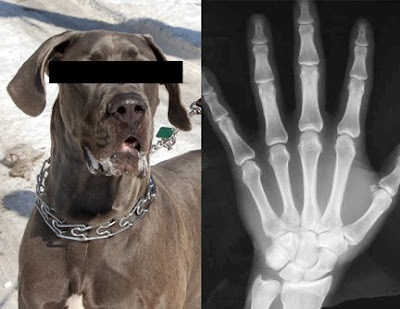 Anonymous Dog's owners feel very bad about this, but they shouldn't. Dog-walking sounds like a laid-back, "easy" job, and for the most part, it is - - but I'm posting this story as a warning to all who walk their dogs when I'm not doing it for them. Even the tiniest, calmest dogs can surprise you and, unfortunately, hurt you no matter how in control you think you are or how many times you've walked them with no problems. Stay alert!!! Oh - and since I'm probably going to be incurring a lot of doctor bills in the future, all of your daily dog walking rates just went up to $20 a walk.